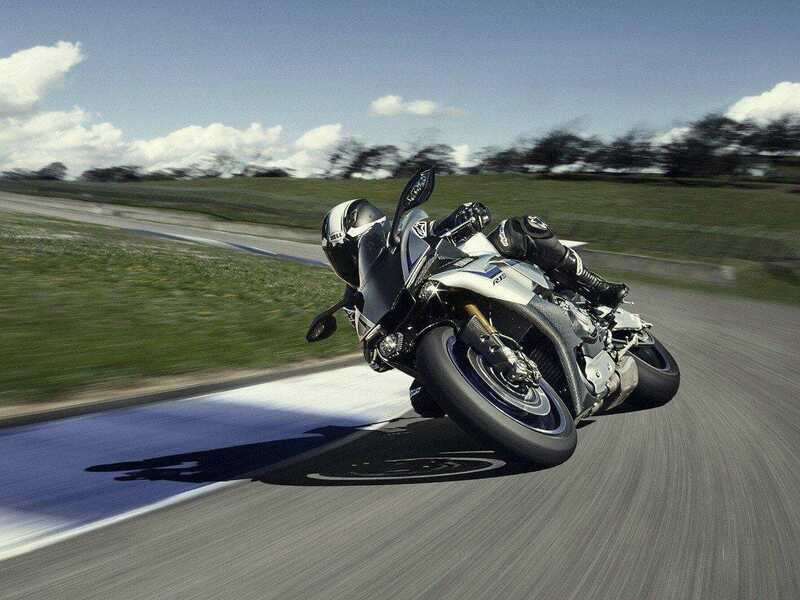 First of all, the R1 is designed for the racetrack . You can see it already on the new look. 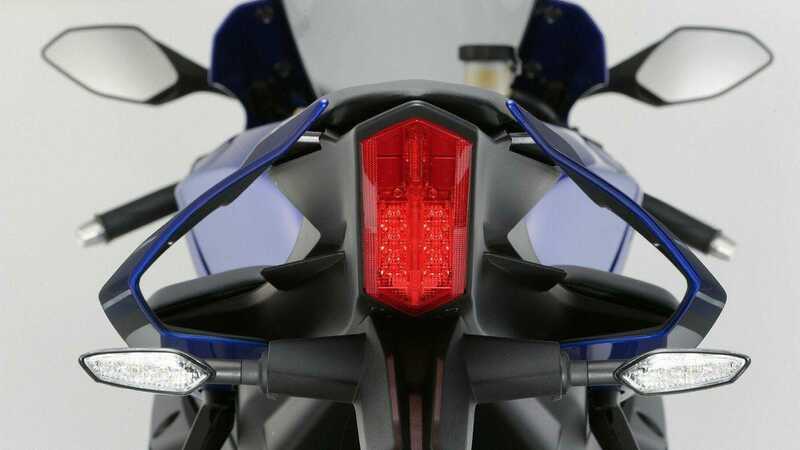 There is no evolution of the old ones, no, it is inspired by a racing fairing. Actually, this is only logical. The headlight technology is progressing and the parts just keep getting smaller. When they were now well hidden. 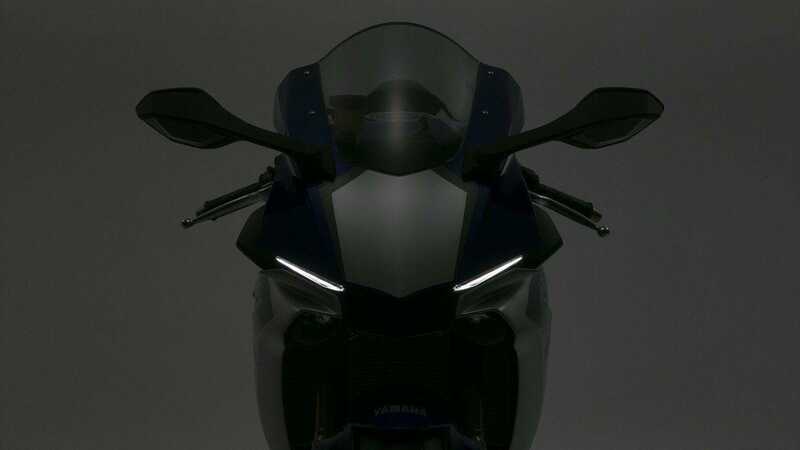 That’s a bit strange, because the “face” of the R1 now missing. Although the two LED status lights (now called position lights) remind a bit of the old headlight, but the actual bulbs including fall fully out of character. In the blue-silver model you can see the connection to the track very well. I really find the “silver plate” not pretty, but it is a perfect place to bring his race number (only should not be too long). I personally would but definitely choose a different decor or make the cockpit quite blue. But tastes differ, but I would take the red if anyone wants to make me a joy. In the social networks is also discussed already strongly about the new look. Some love it and some hate it. 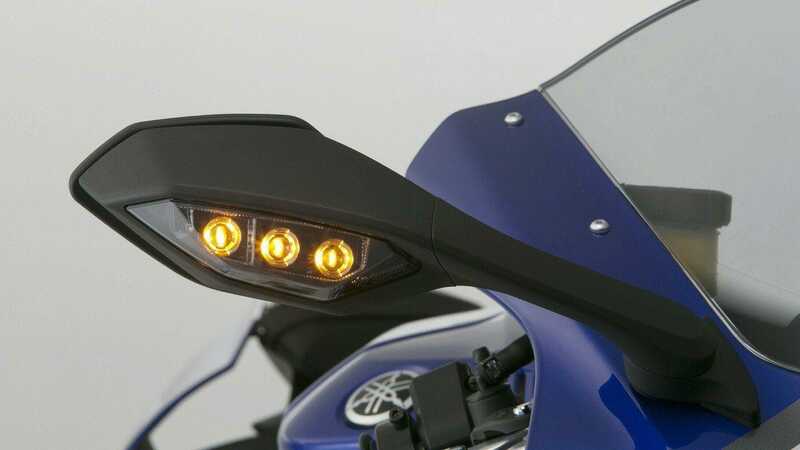 Of assistance systems it is also no shortage of the new R1. Here the Moto GP will benefit from the rich experiences. It is the sensor unit IMU (6-axis inertial measurement unit) are used, which fulfills the requirement for 3D control interventions. Traction control with tilt detection, a patented Slide Control system, a control system for a growing Front (LIF), a launch control system, a shift assistant, an ABS and a combined braking system, to name but a few also be used. 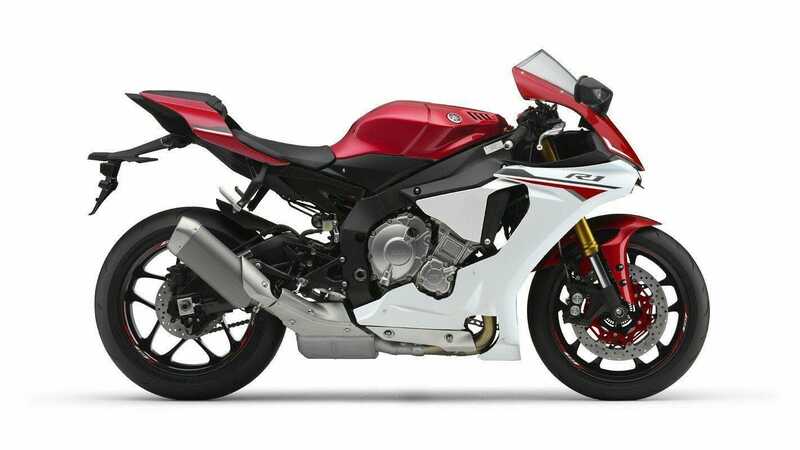 ABS knows everyone, but additionally the R1 has a combined system on board. 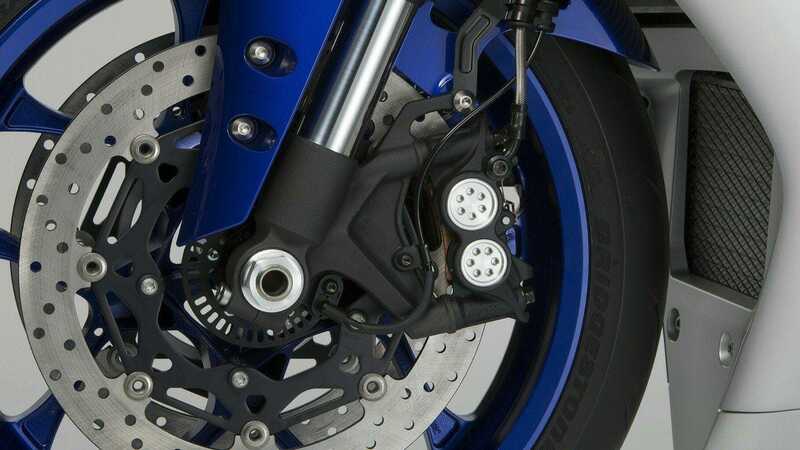 Here at apply the front brake, the rear brake is easily controlled with. By pressing both brakes providing for the necessary balance. For this data the tilt and skew angles are taken here. 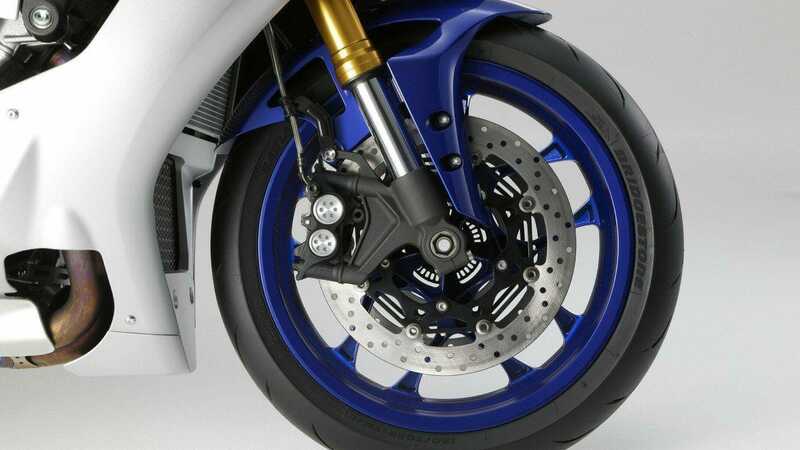 If only the rear brake using the system but does not intervene, then it also slows down the rear only. So again you realize the racing genes. 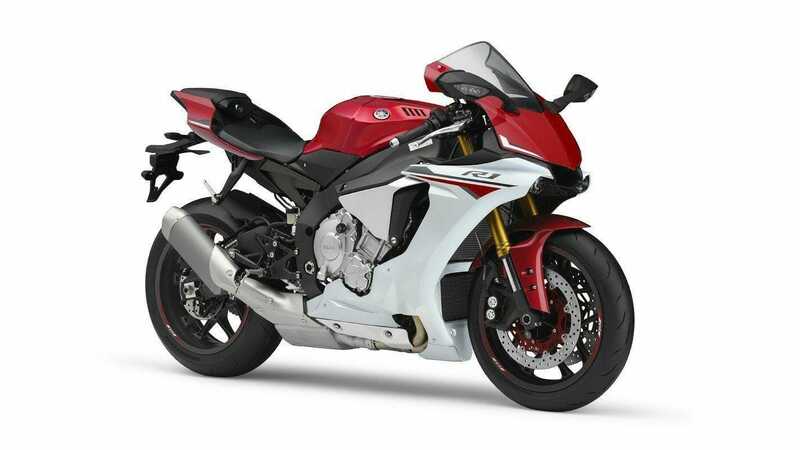 Comes the R1 with lightweight magnesium wheels. In comparison to cast wheels saves here a 870 g. 530 g forward. 340 g rear. That is about 4% less rotating mass in front and 11% rear, which enhances handling. The tank is made of aluminum and holds 17 liters. Weight saving compared to a steel tank is 1.6 kg. The price I know not yet. 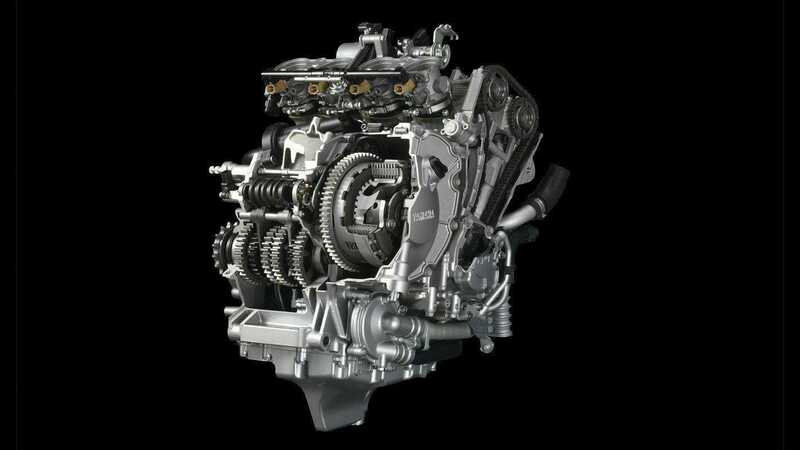 In the series four-cylinder engine with 998 cc displacement redesigned crossplane crankshaft is used. Your sophisticated firing interval makes a significant contribution to the linear torque development, which gives the driver the impression that the throttle had a direct influence on the rotational speed of the rear wheel. This creates a stronger pulsation in the lower and medium engine speed range, resulting in a more linear torque development results. 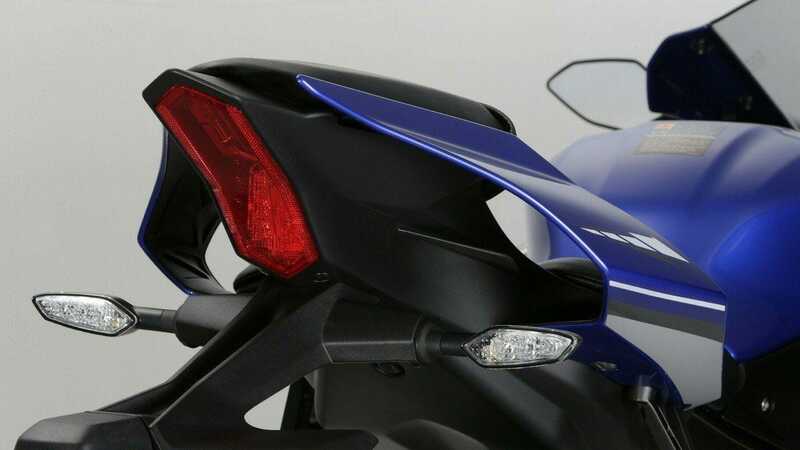 The crossplane engine is also apparent in the distinctive exhaust sound. 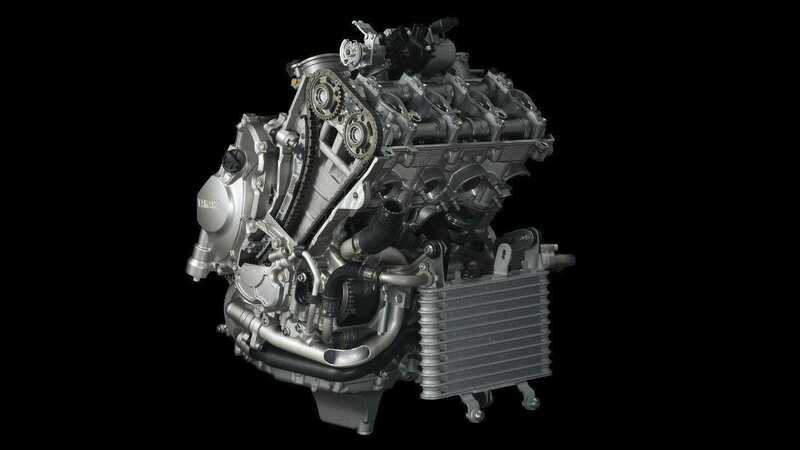 The new 147 kW (200 hp) engine has nothing in common with its predecessor. 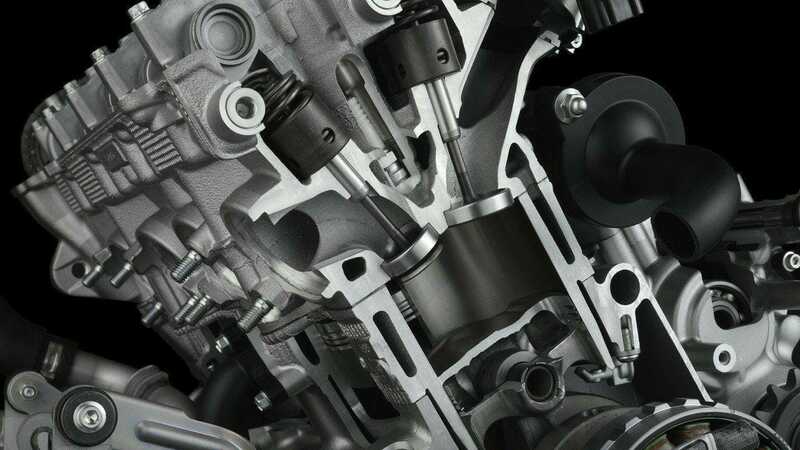 The main differences of the engines include: The bore – / stroke ratio, the compression ratio, the cylinder, the cylinder head, the fuel injection system and even the crankshaft. The only thing that remains is the model name. In order to improve the acceleration, the flywheel mass was reduced by approximately 20%, even though the crankshaft drives a balancer shaft, whose weights are placed close to the outer cylinders. Thus, a large amount of fuel-air mixture can quickly flow into the cylinder, the cylinder head is the R1 provided from 2015 with optimized flow channels and large intake and exhaust valves, which have a plate diameter of 33 and 26.5 mm. The compression ratio is 13.0: 1, which is also due to the narrower valve angle enables a more compact combustion chamber shape. The newly developed forged pistons are very sturdy and very easy thanks to the `Bridge-box ‘design on the bottom. For an additional piston cooling from the underside provide new oil nozzle, spray the engine oil in the direction of the piston crown. (Diamond-Like Carbon) and are extremely fixed rotational speed. To support the cylinder filling at each cycle effectively, to use an air filter with a handsome 10.5 liters. The intake system is thus 23 percent more voluminous than before and allows greater air transfer to the velocity stacks, the (Yamaha Chip Controlled Intake) YCC-I work with the system. The system operates electronically controlled with short and long velocity stacks that allow engine speed and load dependent flow optimizations and thus contribute to the effective cylinder filling. This benefits both the torque yield and peak performance. The new 10.5-liter air box is supplied via a centrally integrated in the casing inlet opening with fresh air. At high speeds, the air flows with significant pressure and can be used by the YCC-I system to improve performance. 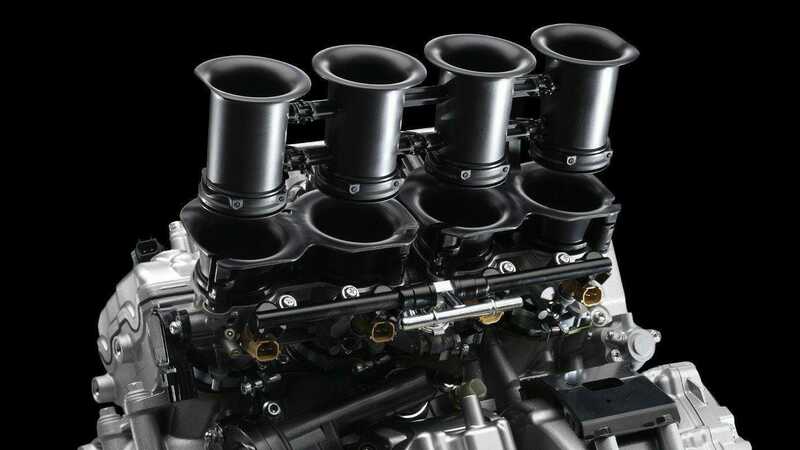 That should provide about 200 hp!?! There are even 200 hp without ram-air indicated, or how can I understand this? Under the engine the four titanium exhaust pipes converge into two pipes, before they lead to a 5.2-liter silencer. Then it goes on about a new exhaust valve in the muffler, which is placed centrally under the motorcycle. 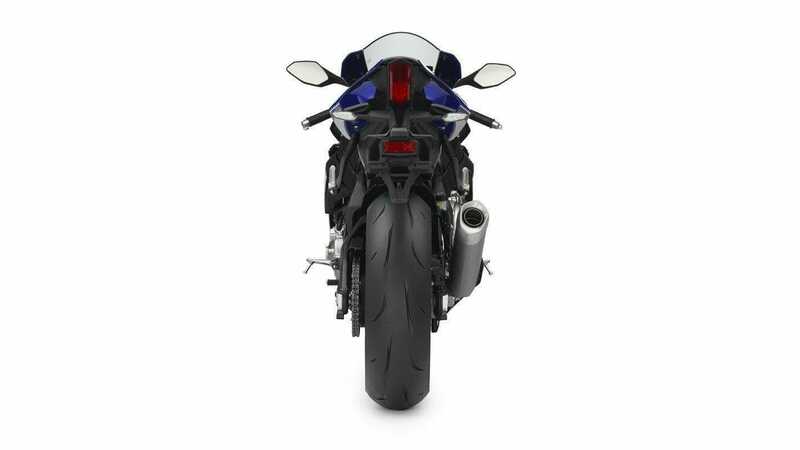 At low and medium speeds, the exhaust gases flow through one of the two passages. 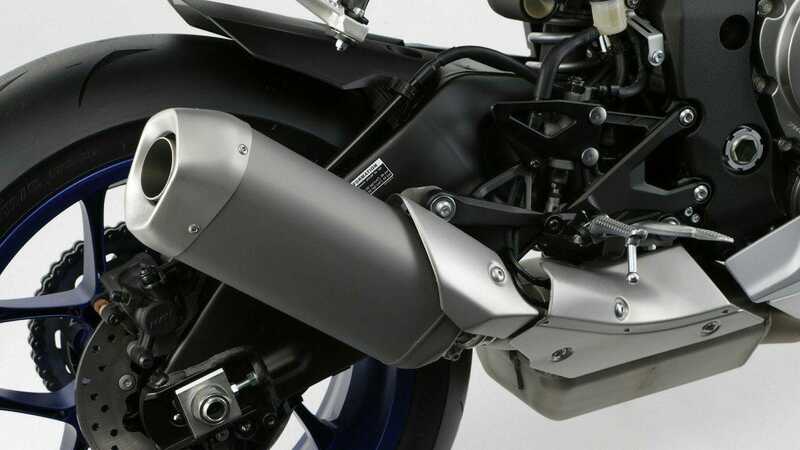 Only at high speed opens the actuated by a servo motor exhaust flap between pre- and muffler and gives way on both pipes free. The new clutch has fallen 19 percent lighter and more compact. The diameter was reduced by seven per cent compared to its predecessor. What makes a slipper clutch? When hard downshift she opens the clutch up to 50 percent to prevent a momentary blocking of the rear wheel. Magnesium rear frame can be achieved. 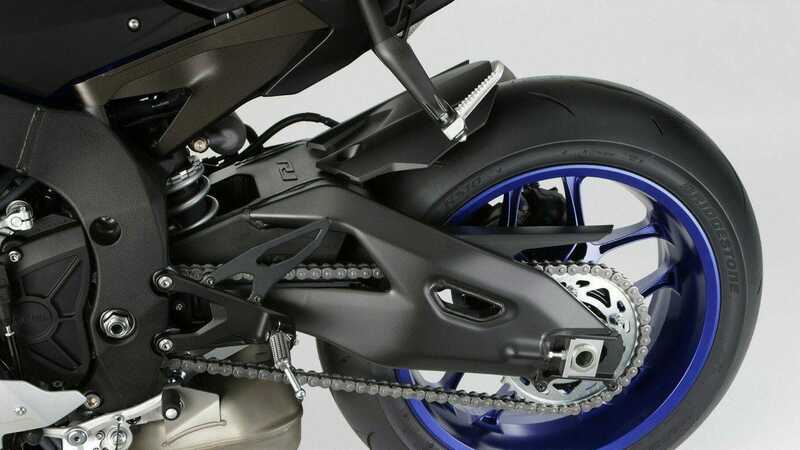 The new wheelbase is 10 mm shorter, 570 mm long swingarm has lost as much as 15 mm. Steering head angle and fork bridge shots are identical in dimensions, while the front axle is increased by three to 25 mm. The Upside-down telescopic fork with 43 mm stanchions strong allows 120 mm of travel and carries thanks to the 25 mm axle for steering precision. 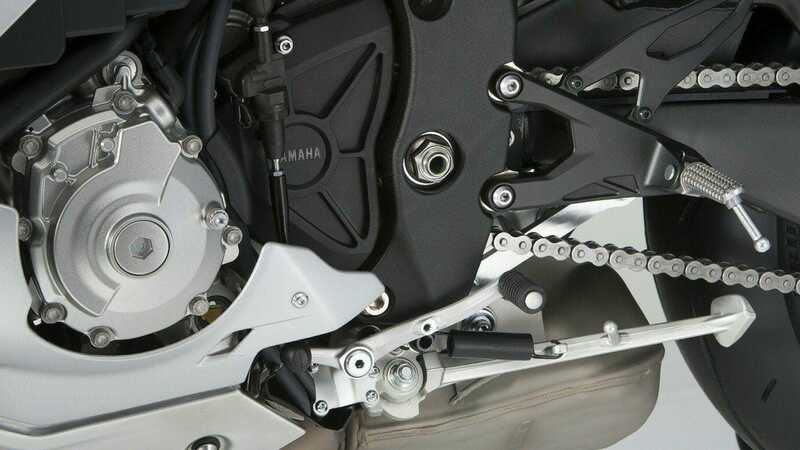 The new swingarm with reinforcement overhead is supported via a lever system and a monoshock. 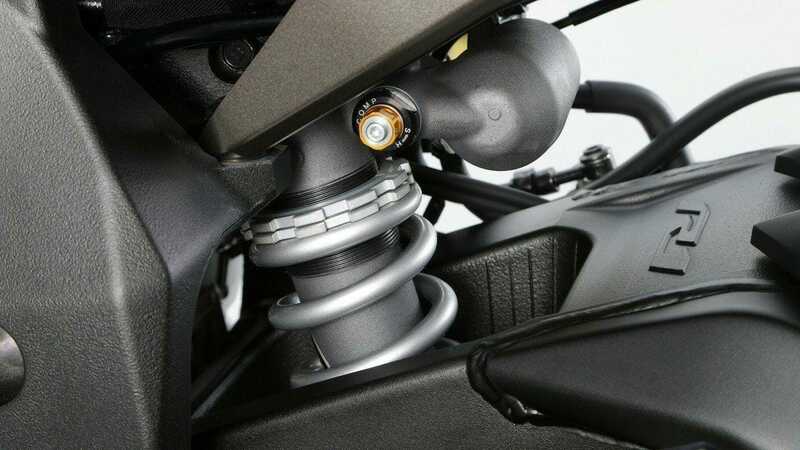 The suspension is fully adjustable. At the front, one-piece molded four-piston calipers, stainless steel reinforced brake lines and two 320 mm brake discs are used. 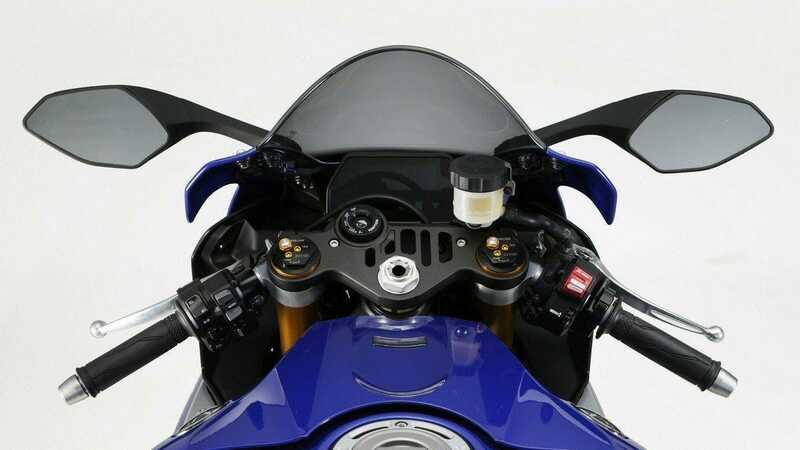 The R1 comes with a sensor cluster. This includes two accelerometers and angular rate sensors combined, the three-dimensional work and detect any movement of the longitudinal, vertical and transverse axis. Therefore, the sensor unit is called in English “6-axis inertial measurement unit”, short IMU. The data is sent directly to the ECU control unit. The sensor unit has been developed exclusively for the new R1 and included in the rate gyro pitch, roll and yaw motion while the acceleration sensor measures how fast the vehicle is moving in that direction. This measurement is carried out three-dimensionally. The data are collected and processed 125 times per second. allows (pull black lines is not a problem, as Rossi and Co). The traction control TCS relies on information from the sensor unit. In all, the inclination is considered and adjusted accordingly, the engagement in the systems. A Lanch-control and a quick shifter are also on board. 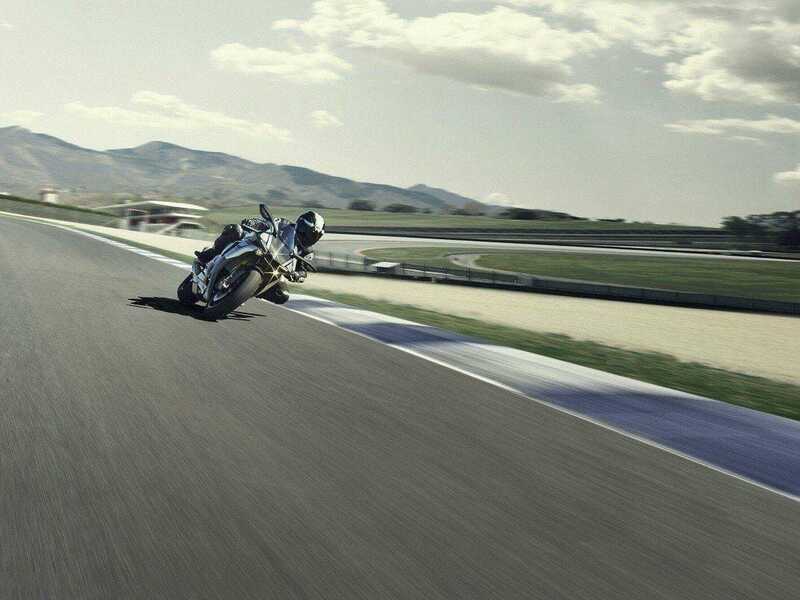 The Quick Shifter ensures that can be switched without pressing the clutch in the next higher gear. Different driving modes are of course already pre-programmed. The equipment of the Special Edition include electronically controlled spring-damper elements (ERS = Electronic Racing suspension), trim parts made of carbon, a CCU (Communication Control Unit) and Bridgestone tire class. 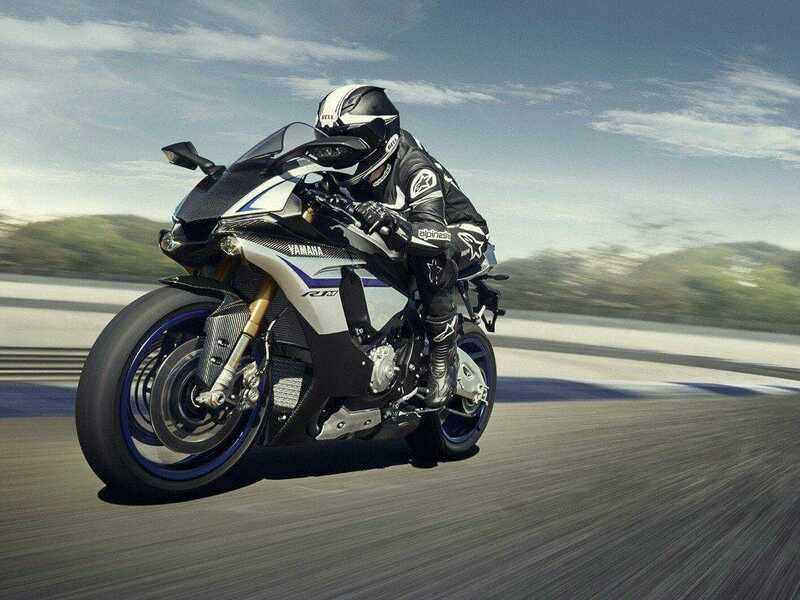 The YZF-R1M is produced in limited quantities. 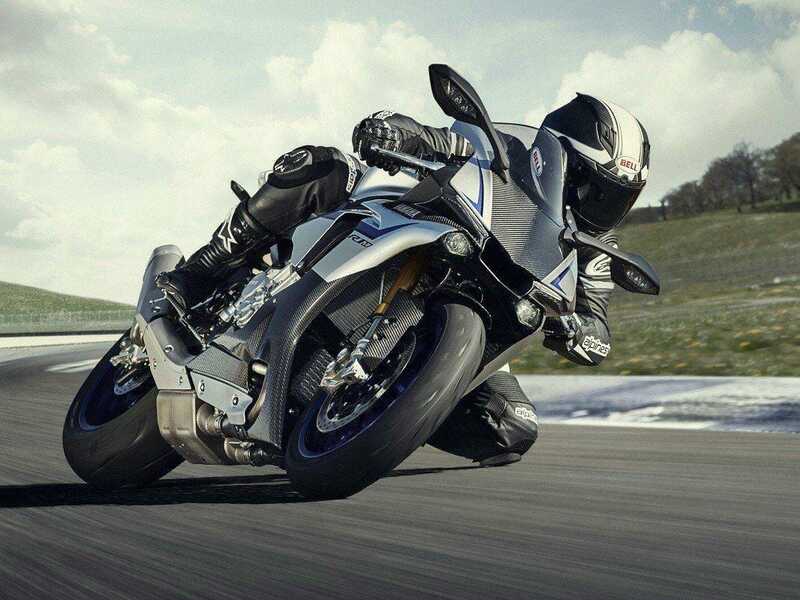 The YZF-R1M is equipped with an ERS system (Electronic Suspension Racing) by Öhlins, the enhanced athletic performance on the race track again. The semi-active system uses the already mentioned sensor cluster and adapts depending on the circumstances. Here you can also turn into an automatic or manual mode. The lining is made of carbon and is coated with clear lacquer. Only in certain places slight color accents. 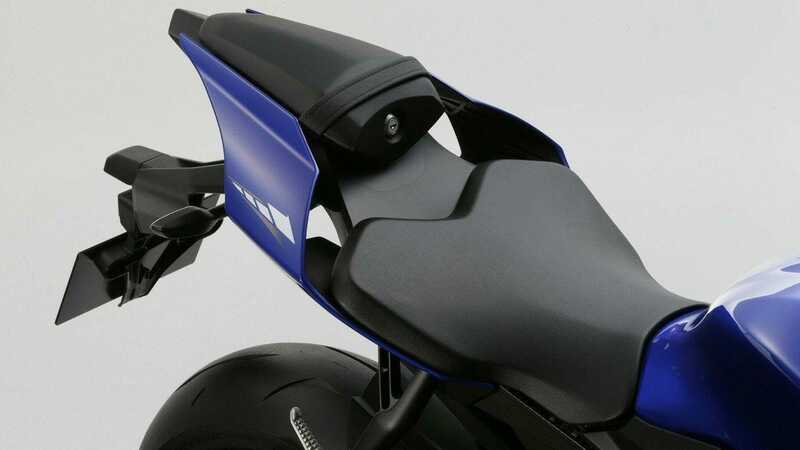 The aluminum fuel tank as high gloss burnished like the upper area of the reinforced rear swingarm. A CCU with GPS is also available. To be able to read the data wirelessly and even revise the software via app after each turn. Other exclusive features include the golden R1M, radially mounted calipers and specially coated, gold shiny steel sliding tubes with 43 mm diameter at the Öhlins fork. 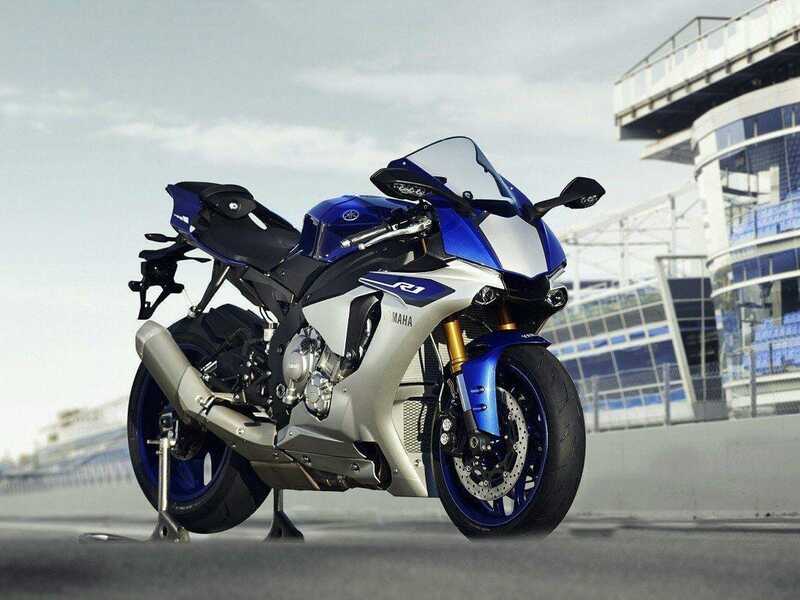 Potential customers can reserve their YZF-R1M on the homepage of their importer and designate their desire traders from the December 1, 2014. The availability of the limited edition model will be checked and cleared all other modalities. 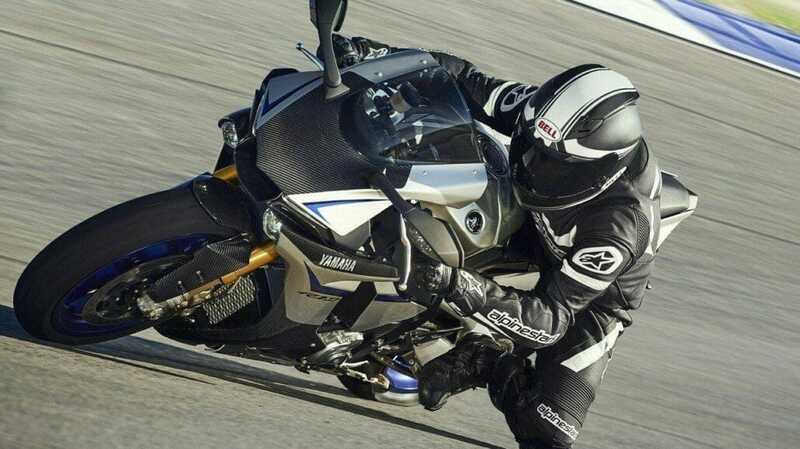 The Yamaha importers will endeavor to distribute the available YZF-R1M models justice. If, contrary to expectations, should remain one left I would make a place for me in the garage. Generously, I would not even ask for booth fee. 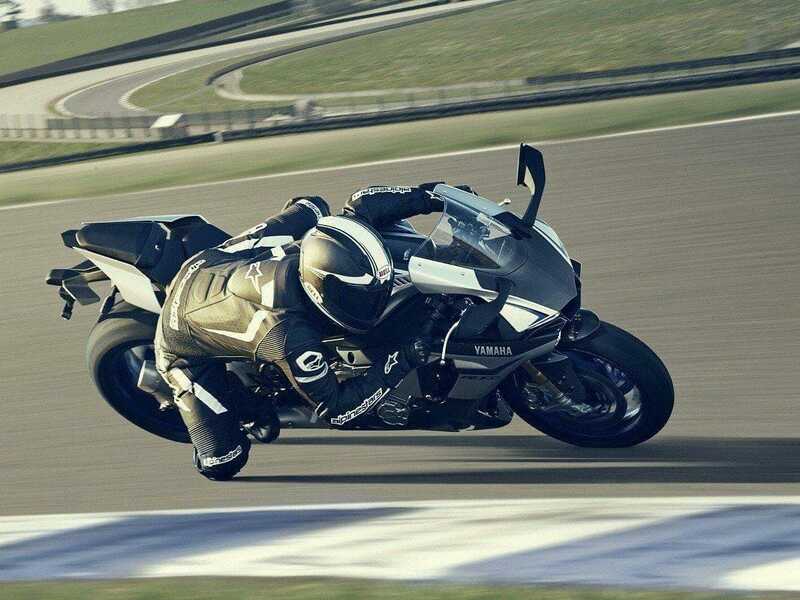 The owner of a new YZF-R1M be invited to participate with their motorcycle in an exclusive and free YRE event. So who has the wherewithal is determined to have fun. 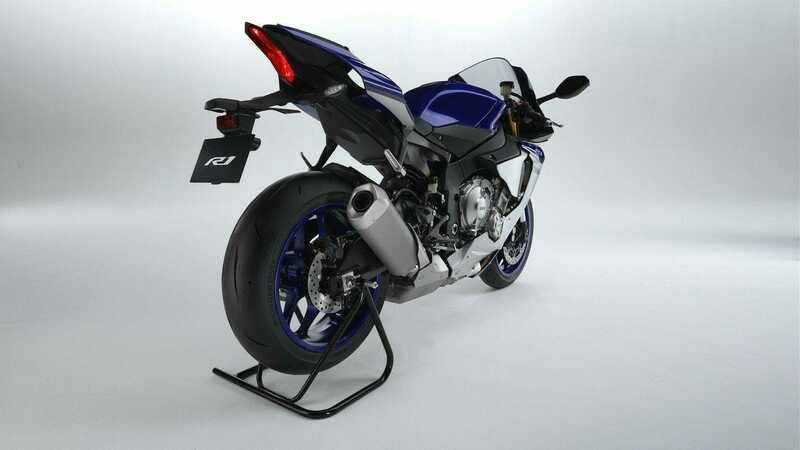 The price of the R1 or the R1M me unfortunately is nothing yet known. Prices should also be announced shortly. Who is it for now managed to read all this far ??? Respect it! You’re a real R1 fan! In Europe, the two come in March 2015. 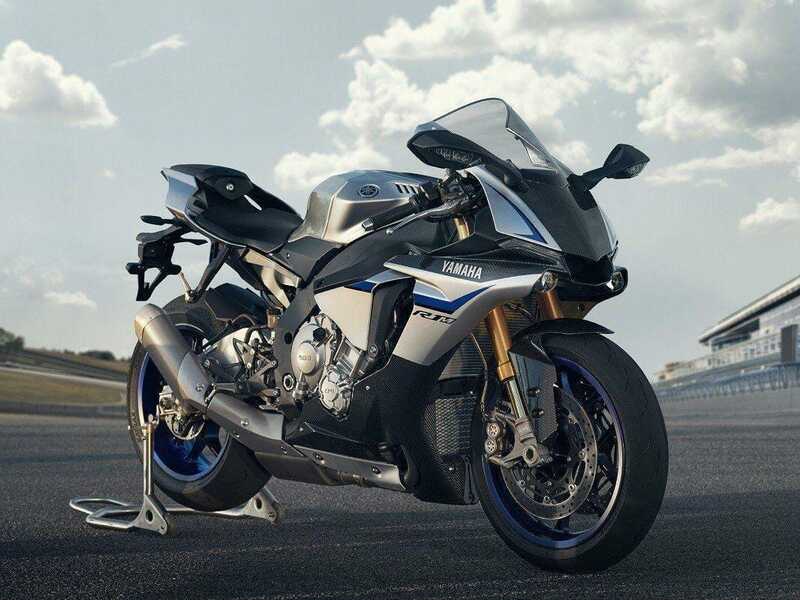 The new R1 will be had for € 18,500 (plus costs) and the new R1M for € 23,000 (plus costs).